How To Remove Mustard Stains On Carpet in Boulder, CO 80301. For more articles like this, click on Cleancare Artcles. Cleancare of Boulder is always here to help. Call 303-530-0646. So, you were enjoying a large helping of garlic fries adorned with mustard sauce. But accidentally, while munching on some fries and subsequently gossiping with your friend, you spilled some mustard sauce on the carpet next to your coffee table. You must have felt aghast as mustard contains turmeric which leaves behind a stubborn yellow stain (I know, right?). You definitely wouldn’t want to ruin your carpet and just to ensure that your kids don’t find out (they’ll bring the subject up unmercifully for years! ), we step in with our handy and effective tips. These tips will make sure that you get rid of these aggravating stains from scratch so that they become a part of history. Just make sure that you are swift in taking action. This is because the longer these mustard stains stay on your carpet fibers, the further will they set in and as a corollary the more difficult will their removal become. 1. 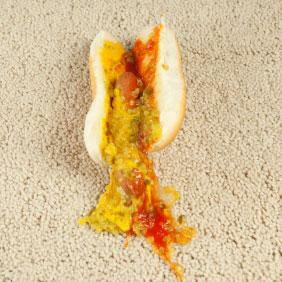 First, you need to scrape off the excess mustard off the stain with the help of a dull knife or a spoon. This should be done with extreme caution and care so that the stain doesn’t spread any further. 2. To take care of the stain you need to make a cleaning solution which can do wonders. To make this spot cleaner, mix three parts of liquid dish soap with one part rubbing alcohol. It is quite probable that alcohol would make the stain appear darker but you need not panic because it would rinse out. 4. Using a clean cloth, apply this cleaning solution onto the stain and rub the mustard stain gently. 5. Allow it to sit on the stain for some time, approximately 10 to 15 minutes. 6. Once this time span this over, rinse the mustard stained area carefully with hot water. Carefully pour clear water (not too much) over the stained are and thoroughly blot with clean, dry rags. Repeat this process until no more suds appear during blotting. A wet / dry vac would also work here. 7. Place a box fan next to the stained area and quick dry it. 8. If any remaining stain still is visible, flood the area with an ultraviolet lamp an inch from the stain (the closer to the stain the better- for higher intensity) for a 24 hour period. Lamps can be purchased from Amazon as well as pet supply and hardware stores. They are very useful in detecting pet urine stains, as well. For further help, look to Cleancare of Boulder. Note: Mustard contains turmeric. Never use ammonia or any product containing ammonia while treating mustard stains. This is because ammonia reacts with turmeric and sets the stain further making it permanent!.